I adore our local Thai restaurant. The lighting is dim. The aromas entice. Its diminutive size invites us to linger in a cozy corner discussing dreams and goals over cup after cup of steaming oolong. I keep telling our boys that one day my husband and I will take them to eat inside the Thai restaurant. I haven’t kept that promise, though we have ordered take-out to enjoy together while sitting on big pillows around the coffee table. I think it may be the one place my husband and I need to keep for ourselves. Maybe we’ll take them to the other, not so good, Thai eatery in town. We can make a different kind of magic there. Create memories of all of us together. Mhm. I think that’s what we’ll do. 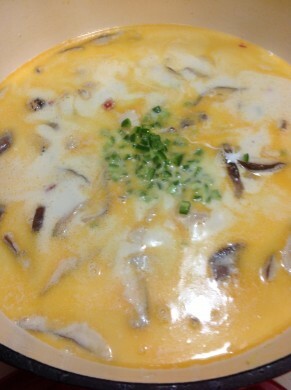 Tom Kha Gai is my absolute favorite dish at our little Thai restaurant. I made it at least once a month while my blog was out of commission, and vowed that it would be the first post on the new blog. Well the new blog didn’t happen. So I updated the old one. Then it happened. I have my own website! So here it is, the first recipe post on my new site. 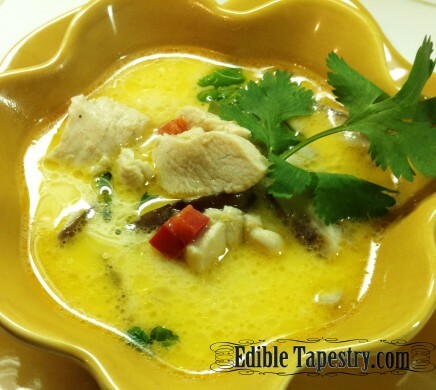 I give you…Tom Kha Gai! I always say it with my nose scrunched. Sometimes while adding a lousy imitation of a martial arts move. I love the sound. 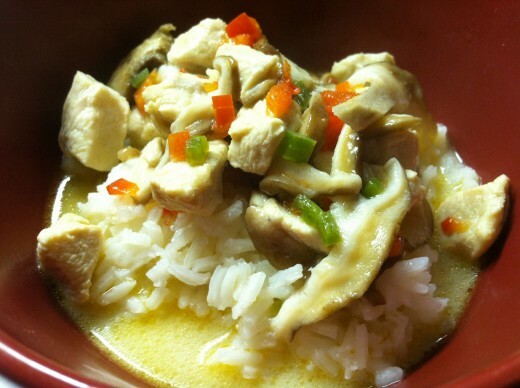 Tom KHA Gaieeeee! Heat the coconut oil in a Dutch oven or small stock pot. Add in the ginger. 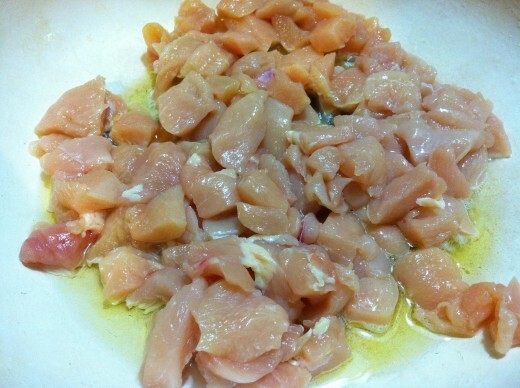 Toss in the chicken to saute with the ginger. 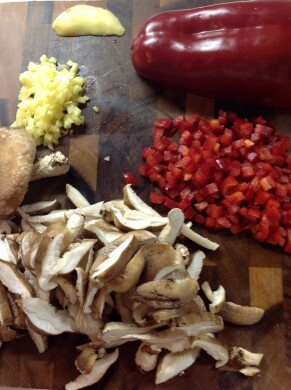 Quickly add in the mushrooms and bell pepper. Saute a bit. 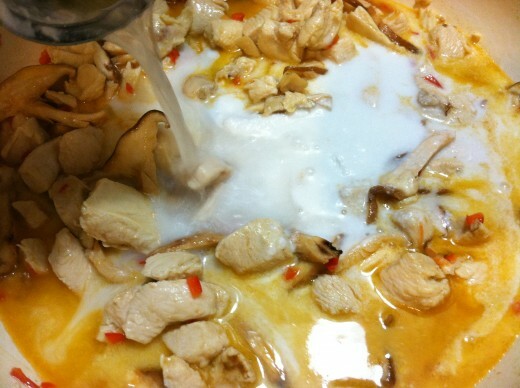 Pour in the coconut milk and water. Add jalapenos. Simmer just until the chicken is thoroughly cooked. 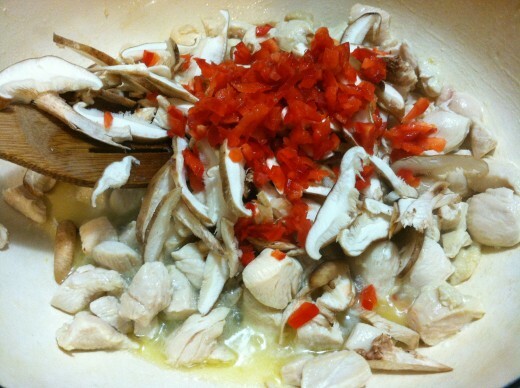 Season with the lime juice, fish sauce, and cilantro. Serve with LOTS of sticky rice. This is one of the few dishes I make with white rice rather than brown. I treasure every starchy bite! Sometimes I toss in snow or sugar snap peas and baby spinach for added nutritional value. Wonderful! 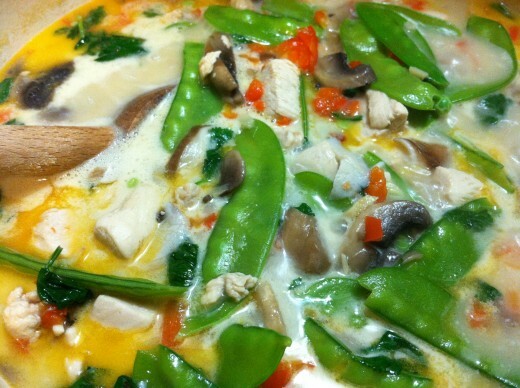 Yield: This recipe makes 4 big soup bowl servings.